When it comes to perfumes and seasons, I'm never totally satisified. In the middle of summer, I long for cold weather to arrive so that I can wear my heavier, spicier fragrances. Then, as soon as winter hits the East Coast, I start craving light, airy scents and springtime florals. Luckily, a kind friend recently passed along a sample of Von Euserdorff Classic Mimosa, and it satisfied my need for an olfactory escape on a freezing day. This fragrance opens with plenty of neroli — one of my favorite "happy" notes! — and orange blossom. Its heart is a warm and bright take on mimosa, with a honeyed note. There's also a generous amount of powdery violet and just a trace of saltiness to keep things from turning too sweet. The base supports the mimosa with a gentle, almond-y vanilla. And I'm pleased to note that Classic Mimosa lasts a good five to six hours on my skin, unlike the lovely L'Artisan Parfumeur Mimosa Pour Moi, which disappears in about ten minutes when I try to wear it. I have to admit that I didn't know much about the Von Euserdorff brand before I received this sample. Now that I've done a little research, I see that it has a familiar story: the well-traveled descendant of a family "involved in the world-trade of rare oils, herbs, spices and petals for nearly three centuries" develops a passion for the family business, studies to become a perfumer and revives some secret formulas from the family archives. We've all heard this one before, right? If Classic Mimosa is any indication, however, the creations of Camille Henfling and Von Euserdorff would hold up even without this tale of lineage, heritage, artisanal craftsmanship and what-have-you. The company also offers Classic Orange, Classic Patchouli, Classic Myrrh and Classic Vetiver fragrances. Have you tried any of them yet? If so, feel free to share in the comments! 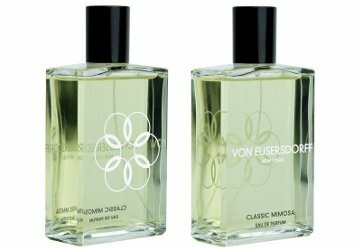 Von Euserdorff Classic Mimosa is available as 100 ml ($159) Eau de Parfum. It can be found at Indigo Perfumery or Twisted Lily in the US, or at Jovoy Paris in France. I have a decant of the Classic Orange and love it! I’ll have to find a sample of the Mimosa after reading your review. Oh, good! This really is a pretty fragrance… and simple/pretty can be difficult to get right, but I think they did it here. I also find the L’AP mimosa hard to smell – I feel like it’s there but I just can’t smell it. I also have PdN’s discontinued Mimosa pour Moi, but it has a heavy powdery effect that isn’t entirely pleasant. So I could use a good mimosa, and this one sounds promising. I’m sort of glad I never tried the Patricia de Nicolai Mimosa pour Moi, because I might have loved it! This one isn’t heavy or very powdery, though, so you may even prefer it! This sounds good. I haven’t tried this line but probably should:). Haven’t tried Mimosa Por Moi either but want to. Speaking of L’artisan, Oeillet Sauvage is available at the L’artisan website. I wonder where I can find a sample of it? Thanks for the review Jessica! I wonder whether they’ve changed Oeillet Sauvage! It was always one of the softer carnation scents, but it did have a nice peppery side too. It sounds utterly delightful. I have unfortunately never tried either Mimosa pour Moi or Mimosaique. My favourite “Mimosa” is L’Infante by Parfums Divine. I’m glad that the fragrance is better than the somewhat silly familiar story. I’ll have to find out where, and if this is sold in Europe. I don’t love everything from Divine, but that last one, the rose fragrance that Angie reviewed — Spirituelle? — was very pretty indeed! I’m lucky that I enjoy the briefness of Mimosa pour Moi anyway – I put that L’AP in the same “category” as so many of the beautiful floral type fragrances of Annick Goutal that are so lovely and so fleeting. What a burden to reapply!! This morning your review prompted me to apply some of the Diptyque Essence Insensee (mimosa) that I bought for my birthday in November. It is just wonderful and it making me think of gentle spring on a miserable freezing day! Today is another freezing day in NYC — but at least it’s sunny and clear! A perfect day for a cheery floral. Jessica, I really liked this one, and I’m a fan of mimosa in general. I also very much loved Classic Orange, which is saying a lot for all the orange scents out there. Also, nice to see the VE line available in the US now — they seemed so hard to find for quite awhile. The Von Euserdorff Classic patchouli is my favorite patchouli scent. I also really love the myrrh & the orange. But they are all well done.